RULES: The competition will be conducted in accordance with current United States Swimming rules. ELIGIBILITY: This meet is open to all USS swimmers ages 10 years old and older, registered with Potomac Valley Swimming. Swimmers may enter only one event per day. WARNING: Any club that enters an unregistered athlete, falsifies an entry in any way, or permits an unregistered coach to represent them, will be fined the sum of $100.00. And no further entries will be accepted from the club/team until said fine(s) has been paid. AWARDS: First through eighth place will be awarded in the following age groups: 10, 11, 12, 13, 14, and 15 and over. OFFICIALS: Officials assigned to this meet please sign in at the recording table prior to the start of each warm-up session. Certified Officials who have not been contacted should volunteer their services to the Deck Referee. TIMERS: Each swimmer must provide their own timer. 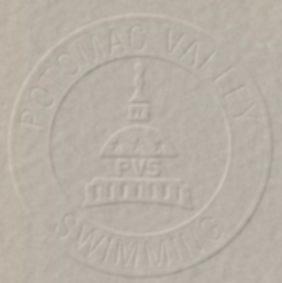 ENTRIES: Submit a Potomac Valley Swimming Entry Card for each entry. A Master Entry Sheet is required and must include the name of the Club entry person. NO LATE DECK ENTRIES ARE PERMITTED FOR DISTANCE MEETS. FEES: All entries are $3.50. Each Club is requested to submit one check to cover fees for the entire team. SCHEDULE: SATURDAY, 25 October: 1000 FREESTYLE WARM-UP: 6:20 - 6:50 A.M. FIRST HEAT: 7:00 A.M.
SUNDAY, 26 October: 1650 FREESTYLE WARM-UP: 6:20 - 6:50 A.M. FIRST HEAT: 7:00 A.M.
5:00 P.M., TUESDAY, 14 OCTOBER 1997.